Process transparency affects the overall experience of your customer in a way which creates intimacy with your brand. How you deliver your product or service tells a story. Too often, businesses miss the opportunity to create greater fans with their brand because they display their best face rather than their real face. I love to share the experience of Krispy Kreme donuts with my kids. 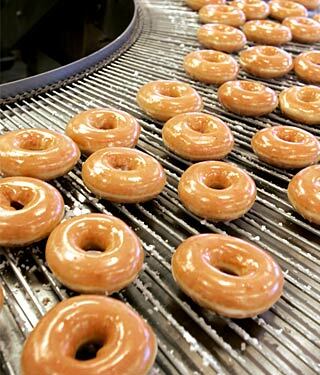 The hot, warm glazed donuts are enough to make me a fan. But when they display a sign that they have hot donuts ready and you are able to walk into a store, the show is transparent. My kids love the plexiglass view of a complete factory before their eyes. It tells the story of how a donut is made better than any words or a book. From the boiling pot to the conveyor belts and frosting showers, my kids (and I) are transfixed on the whole process. We feel the purity of the donut process and the care which goes into what we see in the box. I spend freely because I saw something that helps me understand everything that goes into a donut. I feel a connection. In my past life as a mechanical engineer, I can always remember the thrill of seeing how a part or a product was made. A camera moving through a combination machine and human assembly line helped me understand the requirements for tolerances between moving parts. A machine cut special fabricated part took craftsmanship and had to be sourced with the correct stock. Being connected to the process was far different than theory from a book or ink on an engineering print. The value increased in my mind. The story you have for how your software is built, your content is produced, your customer is won, your service is rendered and the host of other ways you bring value needs to be told. Even more so, it needs to be shown. Your business is the product. Of course, this may mean that a spotlight might reveal deficiencies. You may be making money despite yourself from a bubbling market or a lack of competitors. Transparency with your customers gives them a front row seat to your production. The touch points will force your business to get better. There’s nothing like performance under the eye of an audience. It is getting difficult to hide behind pretensions. Information flows too readily today, especially with prospective buyers. Make your business a show. You will win fans and strengthen your identity. What story does your process tell that your customers are unaware of? Very well written. What you are talking about is important to keep and maintain trust.! Thanks, Keith. Appreciate the comment.